This unit is a two bedroom suite. The suite has a private entrance and a private bath. It is located in the rear of the house so you can enjoy your sleep without extra noise. The two bedrooms have a connected large bathroom. Each bedroom is a large 14 ft x 16 ft. The large bathroom has both a walk-in shower and a tub/shower combination. Should you need room for additional guests, we have another vacation rental on the same property. Please ask for more details. My husband and I, along with our three dogs (Jasper, Baxter and little Jack), moved to the Big Island in April of 2018. We actually landed the same day the Lava lake fell for the 2018 eruption. What a welcome :) I have spent years working at different hotels doing various jobs. It was always a dream of mine to open a hotel. This is even better! I love what I do and I hope it shows in the hospitality I provide. This is truly a unique location. 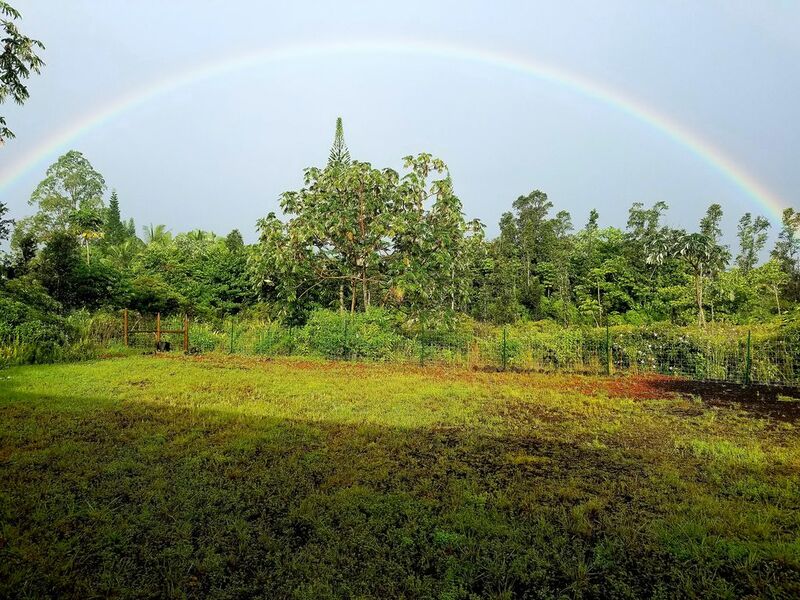 There is so much natural beauty with many recent edible additions such as Lilikoi (of course), Dragon Fruit, Orange tree, a Guava tree and an Avocado tree. There are also non-edible additions such as black clumping bamboo, palm trees, plumeria plants, several different orchids, and many other tropical plants. In the morning and at night, you can hear the sound of the waves crashing against the cliffs. On a clear day, you can see the observatory atop Mauna Kea (very limited view) and at night the the stars shine. The lack of light pollution and tall buildings gives you a a beautiful view in all directions. Another GREAT thing... we are not inundated with coqui frogs, so you won't be kept up at night or have to wear ear plugs. If you want to hear them, you will not have to go far. Rarely needed, but a high powered portable air conditioner is available for an additional $7 per-night. This only covered the cost of the additional electricity. All Linens including sheets, blankets, towels. Basically anything that would be provided in any hotel. Wash and Dry with Tide (or quality equivalent) soap $5 per load. Available when owner is home (most of the time). Wash and Dry with soap $5 per load. Available when owner is home (most of the time). Free and Secure in fully fenced property. Bath, hand, wash cloth and beach towels are all provided. Drinking and coffee cups as well as plates and silverware. CABLE TV IS NOW PROVIDED - Dish TV expanded channel options. There is also many movies and TV shows available on DVR and Dish Prime Time Anytime. Beautiful large private lanai goes right to your front door. There is one short step to get into the unit. I just don't know if the chair would fit through the door. The bathroom has a walk in shower, but does not have other handicap assessable features like handle bars. Large 2-bedroom space in new country home. Large bathroom with separate tub and shower. Plenty of parking. Host was very communicative, prompt, and friendly. Good directions to home. Very quiet with no to minimal coqui frog noise. We would definitely stay at this home again!! !